The best overall motherboard was hardest to choose. With so many motherboards performing so well, and with so many features this was easily the hardest decision to make. In the end we believe that the Epox 4G4A+ deserves to be recognized as "the best of of the bunch". Performance wise, the 4G4A+ was always near to the top of each benchmark and it's just packed full of features. During testing, the 4G4A+ did not BSOD once, or exhibit any signs of instability. 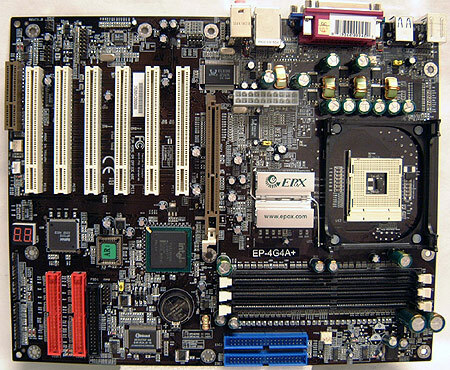 This is a motherboard that I would easily use in my own system and can easily suggest this board to any potential Pentium 4 motherboard buyer. Price wise, the 4G4A+ is well placed, and it was those three criteria in conjunction which sealed the deal, though I think it is safe to say that the Albatron PX845E Pro was a very close second (for reasons we already mentioned). Intel has generally always made well performing chipsets which have the necessary qualities of speed and stability, and the i845E/G chipsets are to be no exception. From its beginnings, the i845 Northbridge has evolved, and matured into a chipset worth building your computer around. As an SDRAM chipset it didn't have much respect, but the move to DDR, then 533 MHz FSB, and recently DDR333 (i845G only) has won over many consumers. Along with the new MCH's is Intel's ICH4 southbridge that brings USB 2.0 to the masses. These ten motherboards are just a sampling of the dozens and dozens of i845 motherboards on the market place right now. It's clear that now more than ever it is very difficult to differentiate motherboards just by the number of features they have. Manufacturers want market share and features are an easy way to make that happen. But features alone cannot make a good motherboard; performance and reliability are equally important. Still, it is nice to know that even basic motherboards are coming from the factory with onboard 10/100 LAN, 5.1 audio, IDE RAID and sometimes even IEEE 1394 (Firewire) as standard! With Serial ATA on the horizon, and hyperthreading desktop processors just around the bend this is certainly a good time to consider upgrading an older PIII to current technology. From the chipset road maps we've seen, it looks like the i845 chipset will be around for a while and for good reason. It's fast, stable and cheap! What consumer doesn't love a chipset like that?